Snowball the white Cochin Bantam today. Snowball the snow-white Cochin Bantam came to us in the fall of 2014 as a two- week-old rescued chick. She came from a farm where she and her fours siblings and their mother were only being fed cracked corn. Snowball flying out of the coop, not able to navigate the chicken ladder. As a result Snowball had some obvious neurological problems. Snowball had a wry neck and when under stress or upset she turned in circles around and around. All of her toes were crooked so she waddles as she walks. I was pretty sure she was suffering from nutritional deficiencies, poor thing. Snowball first fall out in the chicken run. Clover stands close by guarding. 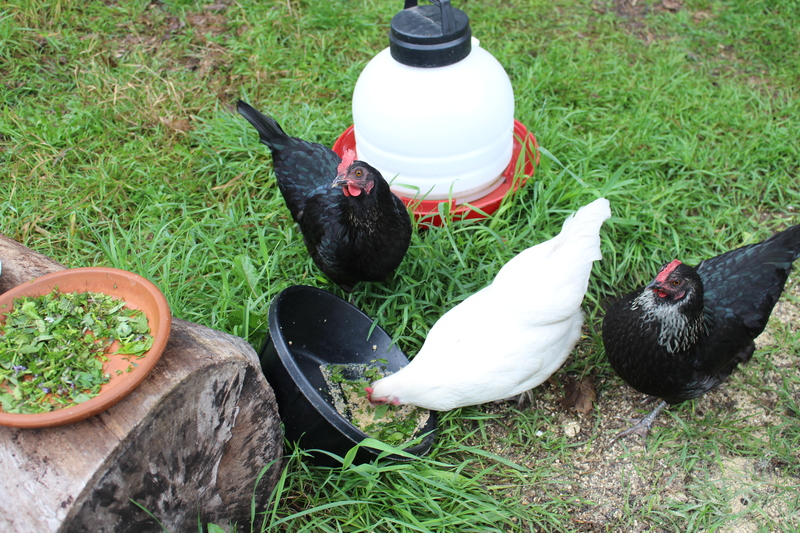 I immediately put the flock on a high quality growers feed and supplemented that with herbs, greens and chicken vitamin drops to try to improve upon their obvious nutritional deficiency. Snowballs body grew but she was never all ‘quite there.’ In fact, I thought she was bit handicapped. 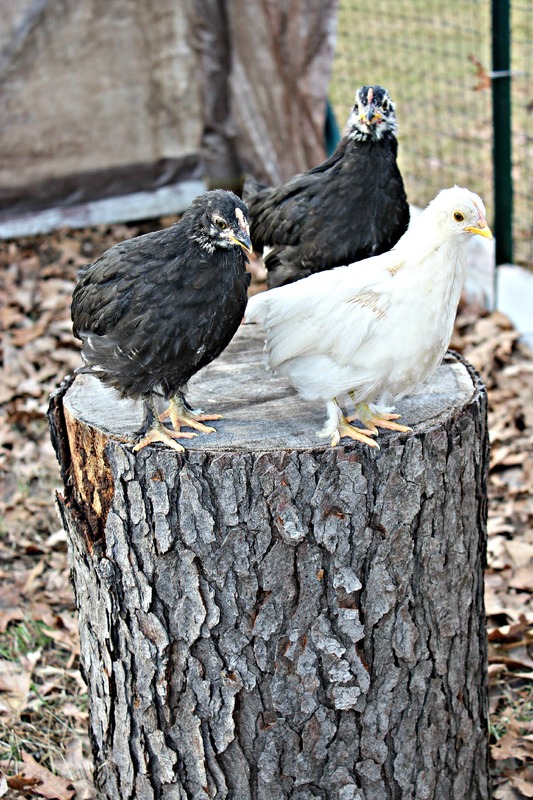 Snowball and two of her Cochin/Phoenix mix sisters posing on a stump. Snowball was extremely connected to her mother, Clover, often removing specks of dirt from her Clover’s feathers, grooming her and even when she was almost full sized she wanted to sleep under her Clover’s wings at night. She was very reluctant to grow up. Quirky Snowball on the stump. The mealworms are how I got her up there! Snowball has continuously been a quirky little thing, a bit odd and unusually funny. 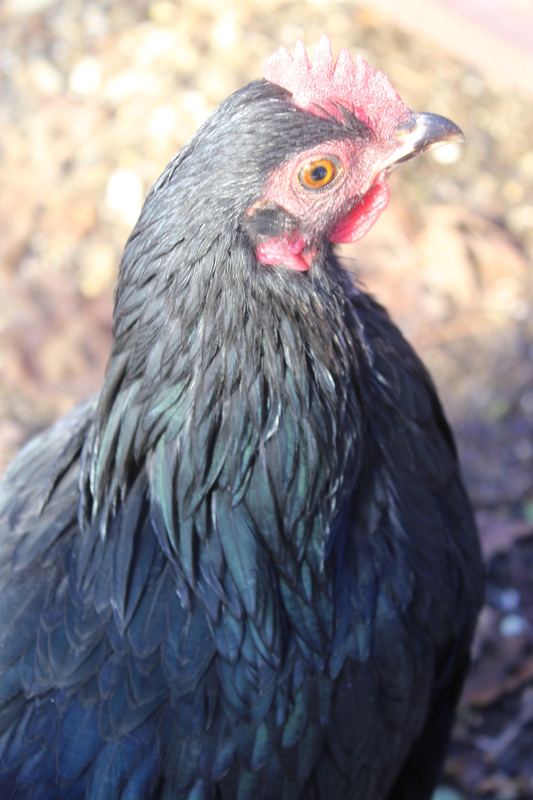 But above all those character traits she has always been sweet like most Cochin Bantams are. It took several months but she began to circle less and less and her wry neck eventually went away. She developed her own personality which is a bit “top chicken” where she pecks away the much larger Rhodies from the food and perches even though she is the lowest chicken in the Cochin flock, she just doesn’t know it! She alerts everyone when crows come around and is kind of the block queen. All the other chickens just kind of melt away and let her have her way. It’s almost like they know she is not all there and have compassion for her and do not raise a fuss. She began to lay, a bit later than her sisters and never laid every day. 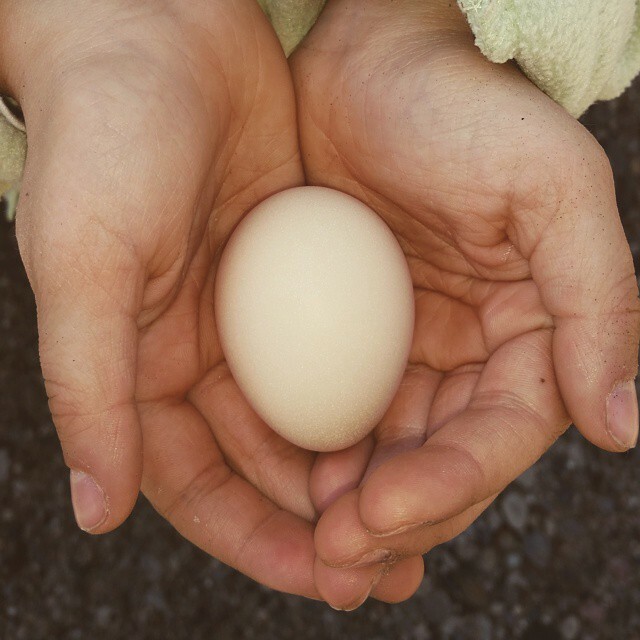 When she did lay her egg she laid the most petite, creamy white egg Not quite full grown. Last fall when the Cochin’s went through their molt it was almost winter time. Snowball molted with the others but never came back in quite the same way. It took her longer to grow her feathers and she never started laying eggs again. I soon accepted that she was going to be a free loader instead of a layer and because she is such a sweetheart, I never really minded. Playtime on the stump in the chicken run. 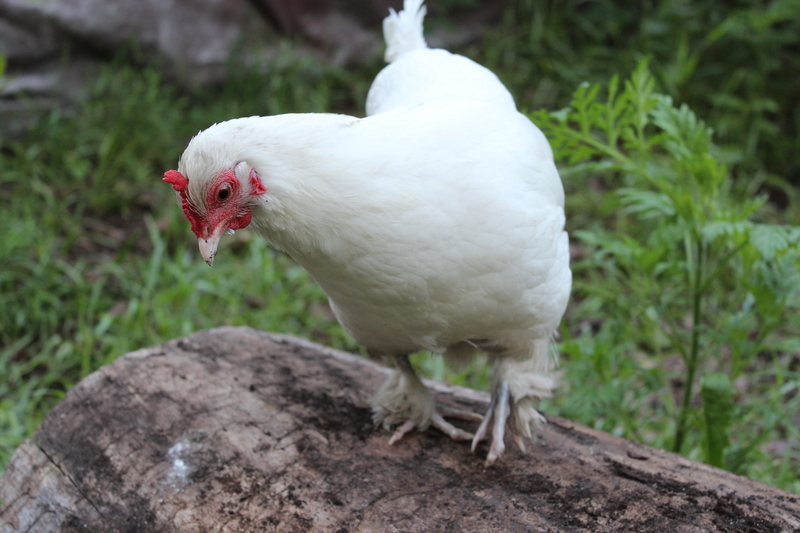 Unlike her serial brooding sisters, Snowball has never gone broody either. Snowball is the bird who photograph was chosen for the USDA 2016 Biosecurity Calendar. One day out of the blue we found a fairy egg. I was pretty sure this meant that someone was beginning to lay again after a long absence, but who could it be? I was puzzled. That funny girl at play..Look at that neck in proportion to her body! Last week we began to see a new and slightly different egg in the nest box. With two Cochin broodies we couldn’t figure out who was laying this new oblong egg. It was definitely a Cochin egg but whose could it be? After the fourth egg it dawned on me that Snowball was finally laying again She was actually laying after almost a year’s off! Oh happy day! 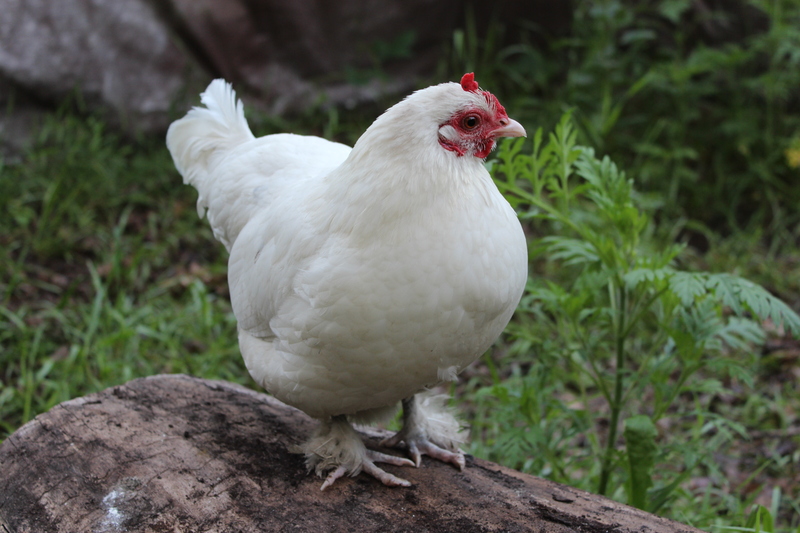 A light-colored petite Cochin Bantam egg. It is funny to me how very one of these chickens develop their own personalities and how we get so attached to them. I’ve had readers write and comment on how sweet she is. I know we are not supposed to have favorites, but Snowball seems to be every reader’s favorite too. Snowball’s two misfires and her normal egg. 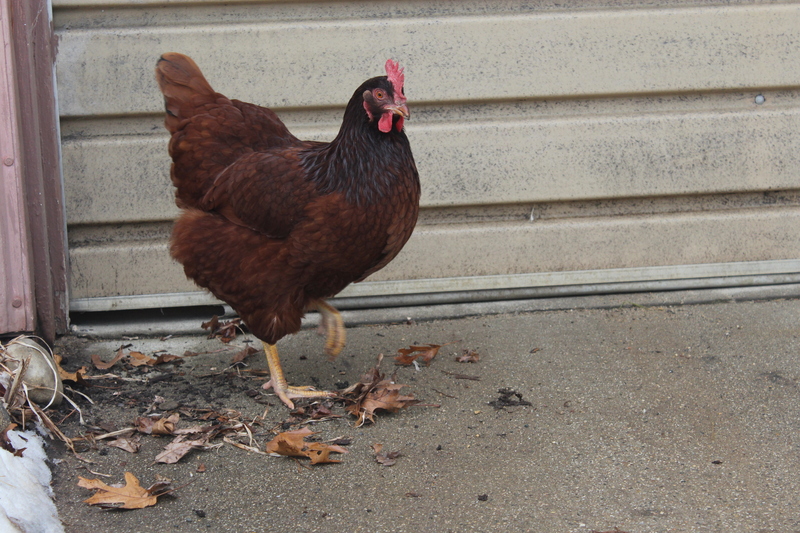 Crystal the Rhode Island Red likes to follow us around the homestead. 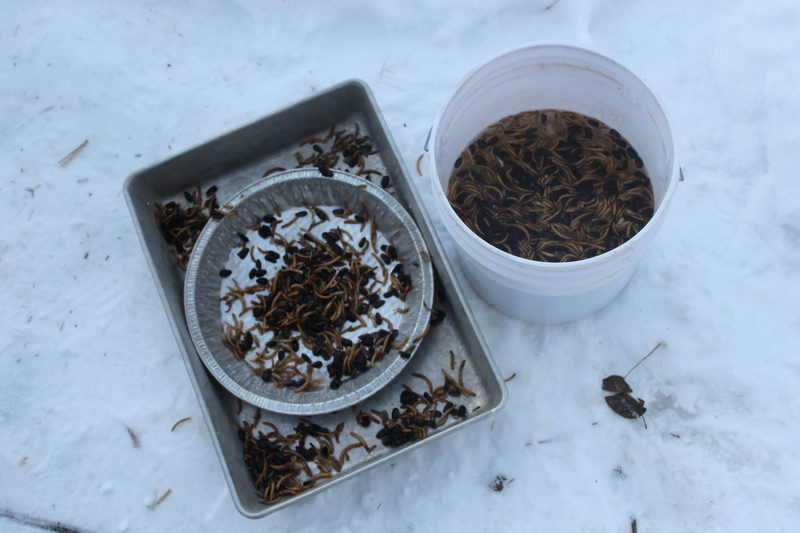 Our winter thus far has been spent, cooking new gluten-free recipes, doing some deep cleaning inside our home, letting the chickens out to free range with supervision and shoveling snow. Welcome to winter in Michigan!! This is our week of January 15, 2016. I hope you enjoy the view! Rhodies and Cochin’s alike want to get out of the run no matter the weather. 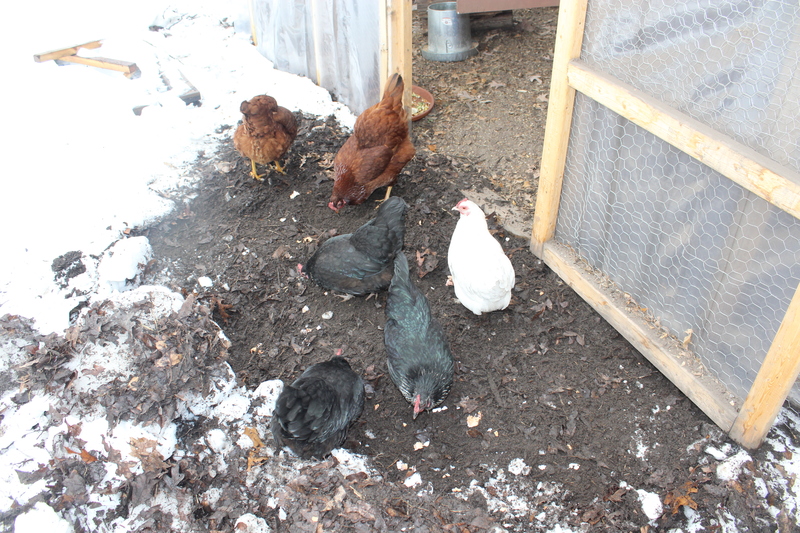 We shoveled snow away from the door to the covered run so the chicks could scratch and peck. Our girls love their dirt! Elsa found a tiny bit of open ground in front of the pole barn door. 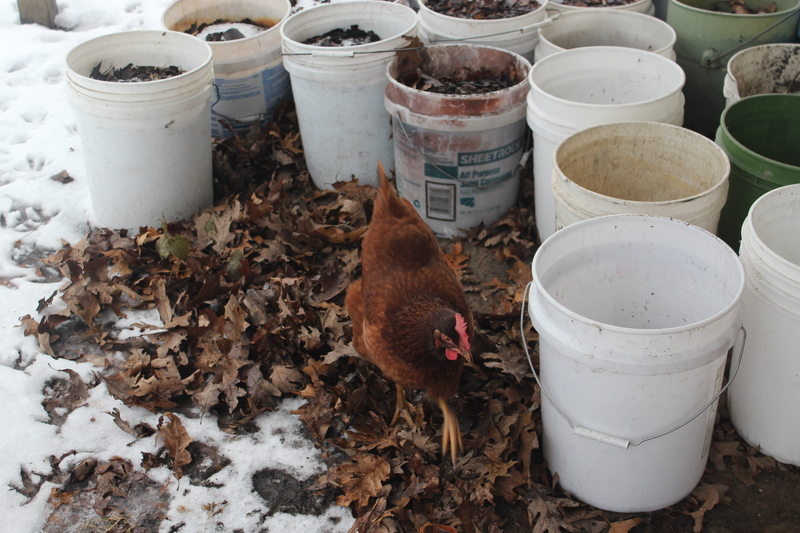 We are challenged to find open areas of dirt or leaves to keep the chickens occupied during the long, cold days and out of trouble. Too much time in the coop means chicken squabbles and the lowest chickens in the pecking order seem to be the one who suffer, especially poor Freckles. The wondering buddies, Crystal and Elsa. This was a tiny melted area about the size of a plate near the front of the pole and the girls found it and scratched around satisfying the Rhodies intense drive to dig, scratch and peck. Crystal and Elsa are wondering buddies. Even when no one else will venture outside in the snow and cold these two avian friends find a way to occupy themselves. Posing at the pole barn! 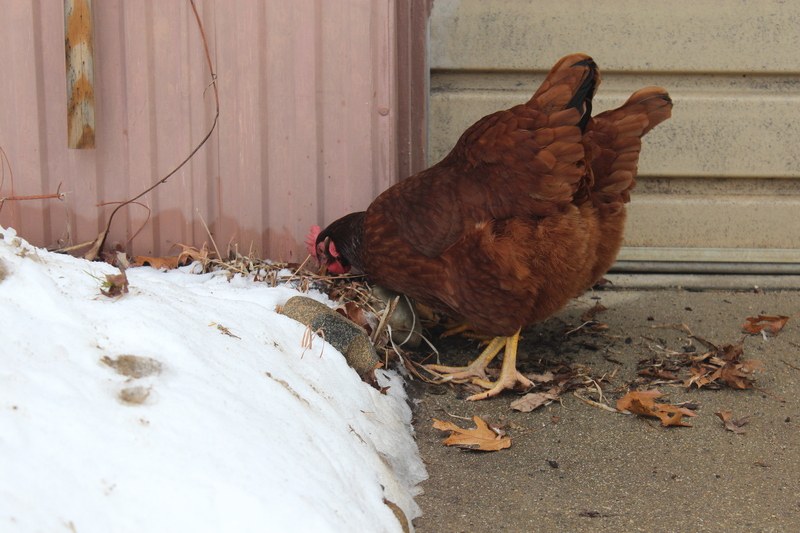 Unless there is a terrible snowstorm, we try to get the chickens outside every day, if even for just an hour. Sunlight, fresh air and exercise are good for the girls and helps to keep them busy and occupied too. When the chicken run gate is open for our morning chores they invariably find their way to the overhand of the forge where there is open dirt and leaves. THIs winter we have stored buckets of bark chips under the forge overhang that we use from time in the chicken coop. 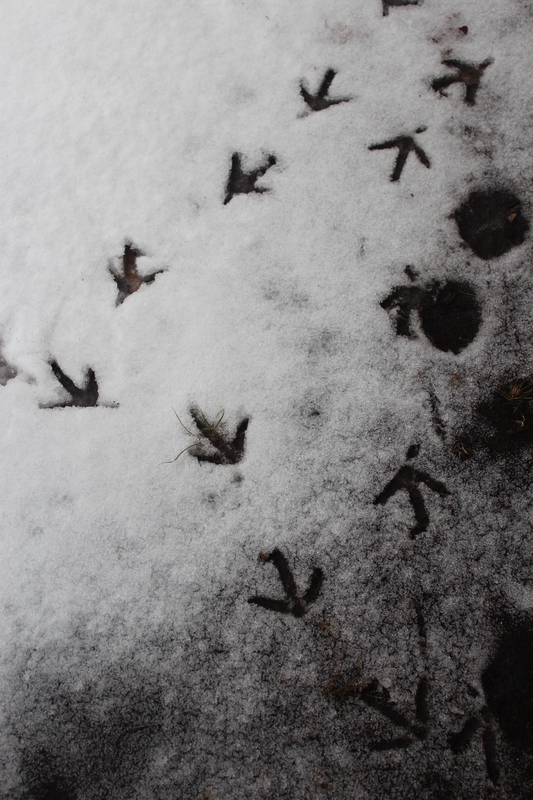 Chickens tracks lead the way to where the girls have been traveling. I hope you have been having some enjoyable travels too! 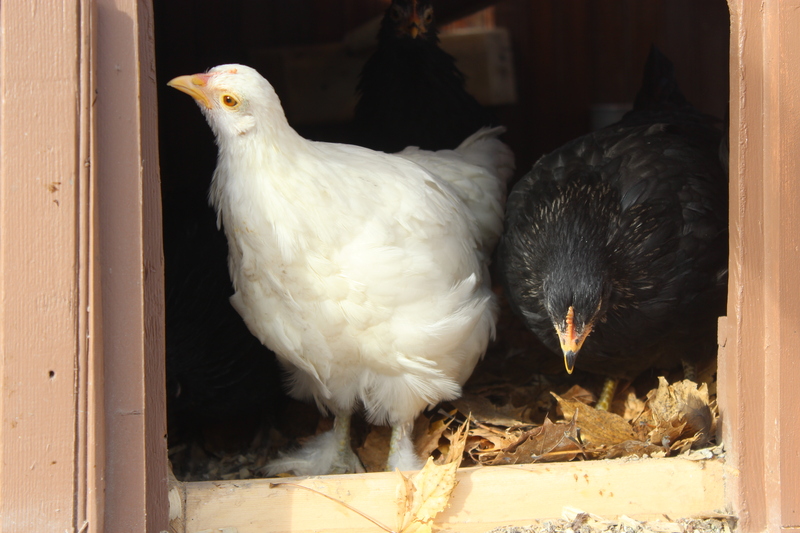 I’ve been observing the differences between my two flocks of chickens now for almost a year. This is what I have observed about their dispositions, their personalities and their applicable place in the homestead or backyard chicken coop. It’s really quite important to pick the right breed for your weather conditions and land characteristics. I also recommend picking a breed that is suitable for your energy and time constraints too. You will be happier and so will your birds. 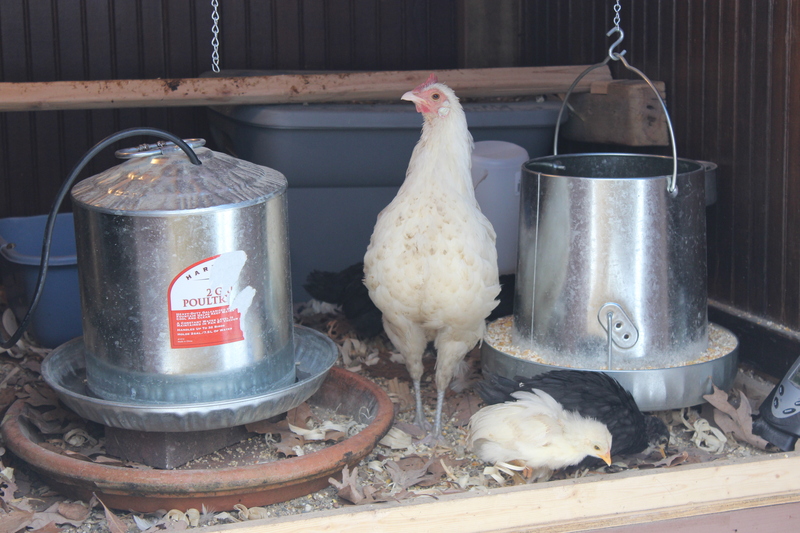 COCHINS BANTUMS: Suitable for an urban backyard coop. 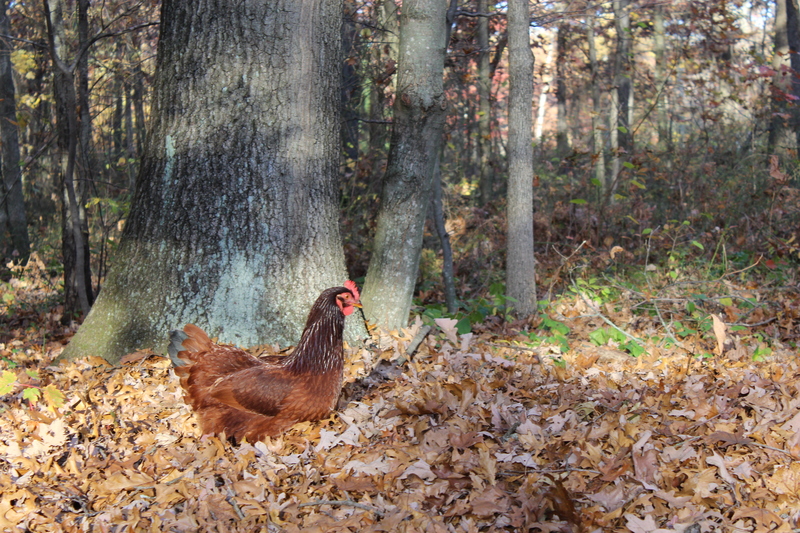 RHODE ISLAND REDS: A heritage breed, suitable for farm or homestead where they can free range. Larger in stature, sturdy birds weighing up to 7 to 8 lbs. Want to be out in the woods up well past dusk so need to be put to bed at night. 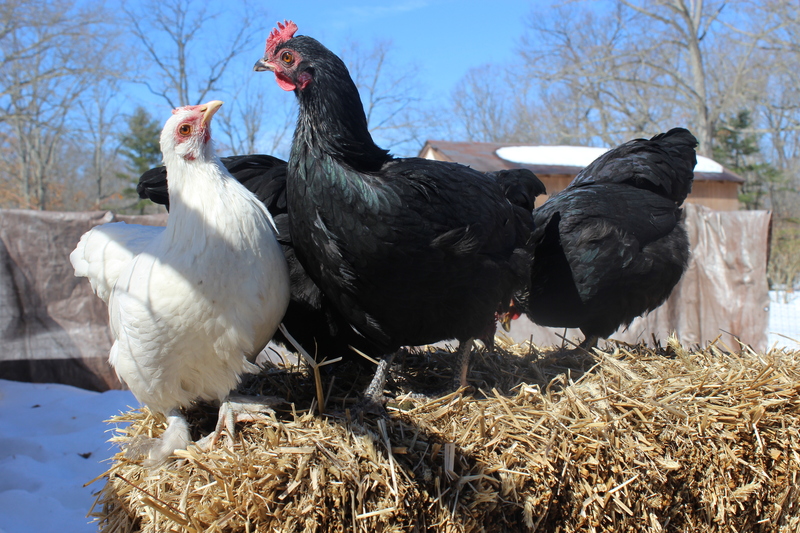 Whatever your situation and whichever breed you choose, enjoy your chickens and the adventures they bring to your homestead or family. They each have their own personalities, most are quirky, fun and interesting to raise and own. I do recommend keeping chickens!! My granddaughter loves to help collect eggs from the nest box. I have been accused lately of pampering my chickens and I suppose that is true. If pampering them means feeding them, loving them and taking care of them as well as I feed my family… then I am definitely guilty. Herbs and mash are a tasty chicken treat. I do feel strongly that their health comes through in their egg production numbers as well as in the quality and taste of their eggs. And I want the healthiest chickens and eggs possible. So I feel my efforts are worth it. I want eggs with the highest quality of healthy fat, Omega 3’s possible. 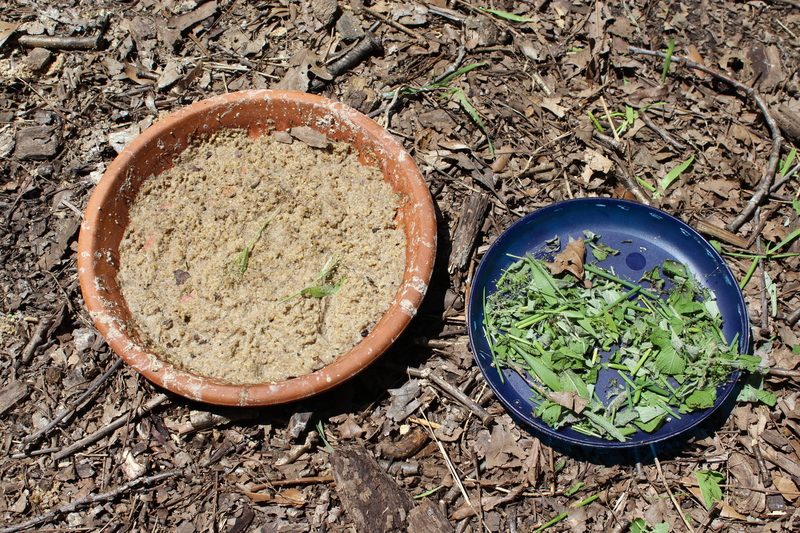 My girls get fed layers feed, greens, herbs, “high-test” (a special high protein concoction I make that is intended to fill them up and keep them warm at night in colder temperatures) and some kitchen scraps. Their live greens includes sprouted barley greens and mung beans. Wet feed and fresh greens are a hit in the coop. 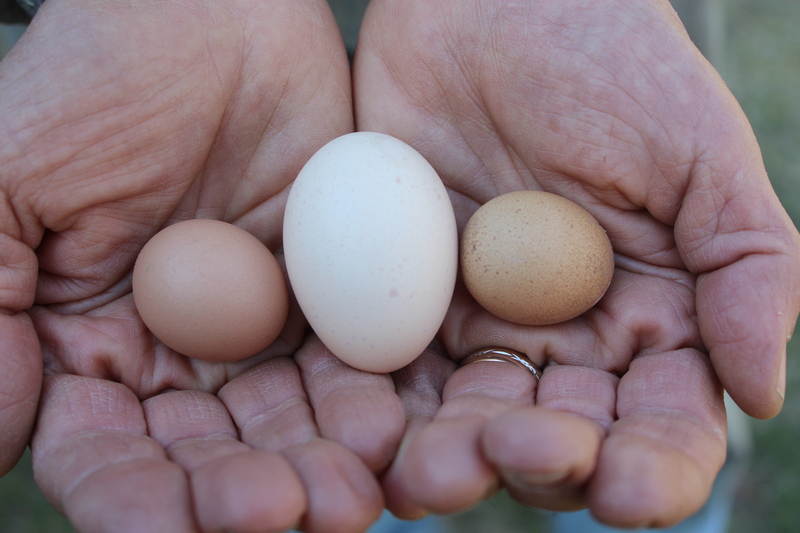 Currently when many flocks have stopped laying an egg production is down my flocks egg production is going up-up-up. This tells me I must be doing something right!! 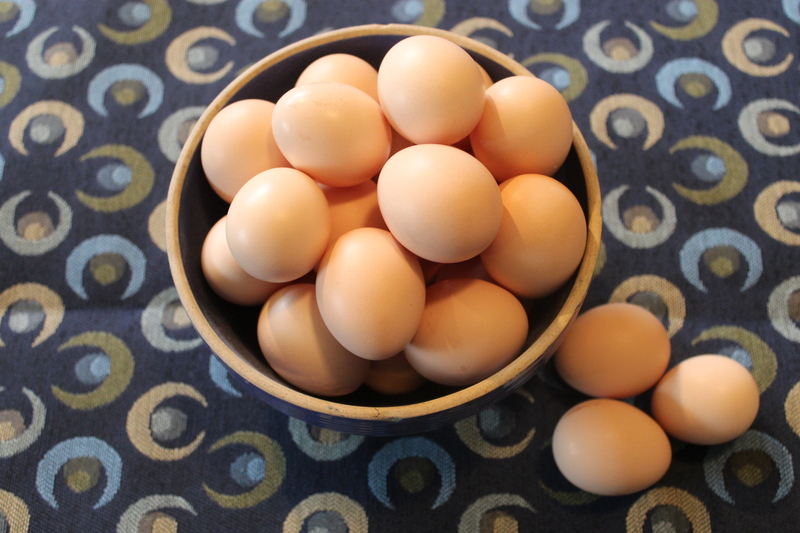 This week our 8 girls are now laying seven eggs most days. I am thrilled! 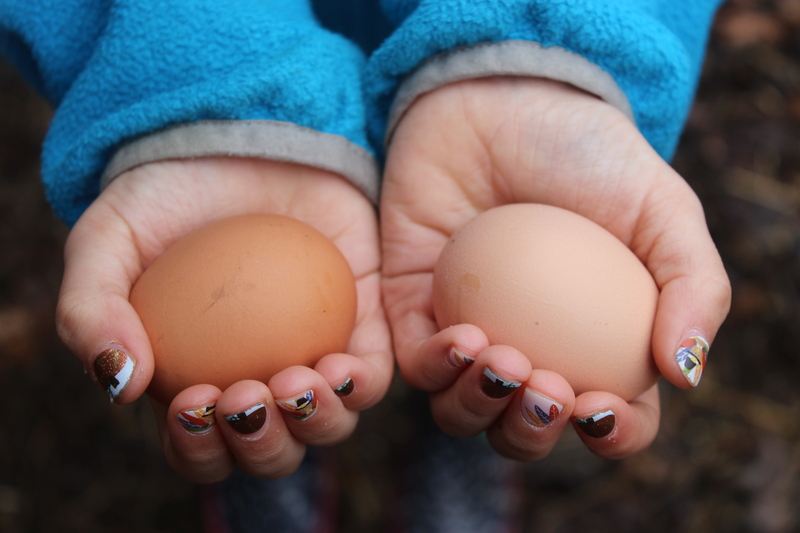 After months of planning, building, growing, teaching and feeding; these eggs are our reward for a job well done. 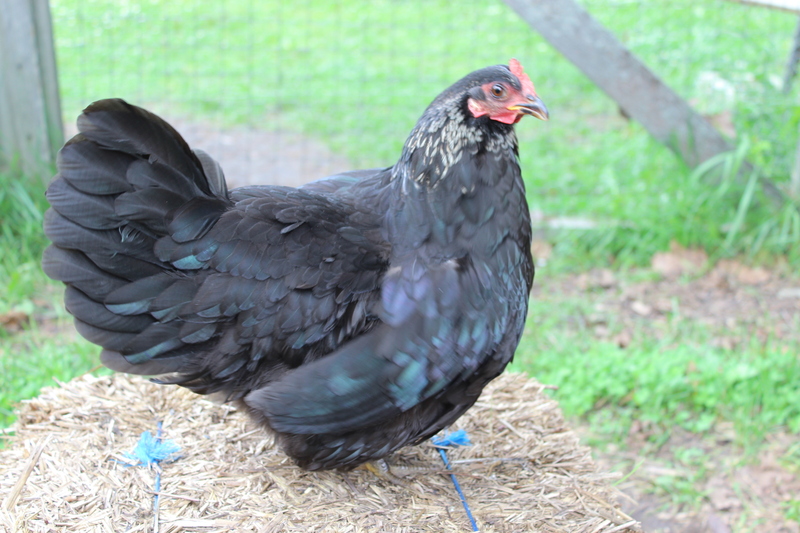 The four-year-old Cochin/Phoenix mix’s are good layers and quite winter hardy in spite of their petite and delicate look. 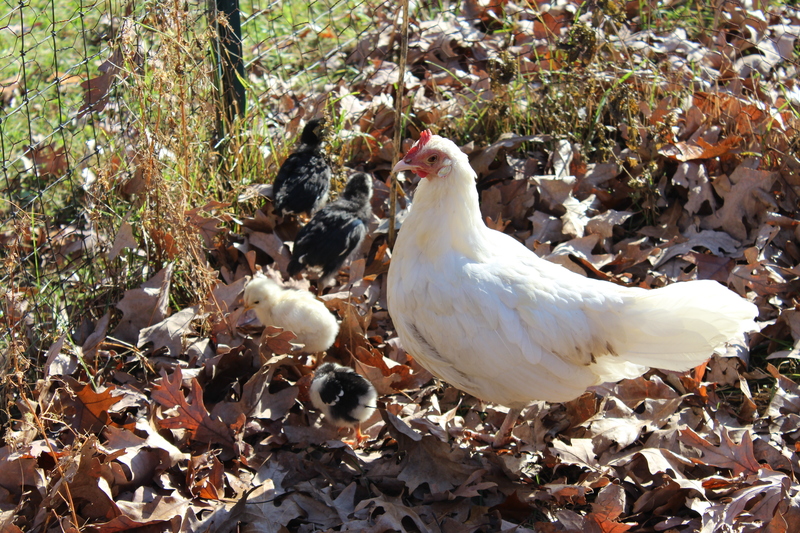 Fluffy Snowball, Sweet Pea, Freckles and Goldie, had a 6-week long broody this fall followed by a hard molt. At the same time we thought we might lose Freckles as her comb went gray and she acted as if she was not feeling at all well but some extra TLC and lots of extra protein brought her back around. Her comb is red again and while she is still the lowest chicken in the Cochin flock, she is happily eating, ranging and laying eggs again. She and Snowball are best buds. The Cochin/Phoenix mixes are have quite the conversation. 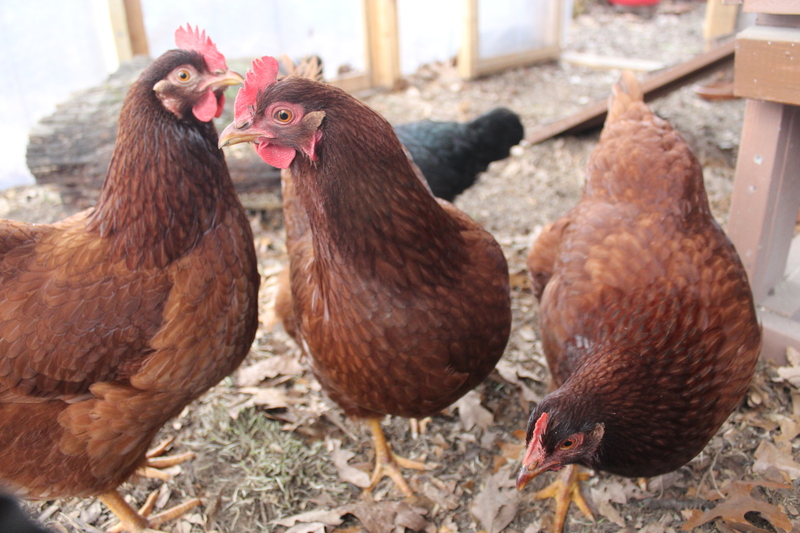 The four Rhode Island Reds are teenagers now at 7-months-old and full of piss and vinegar. Named by our North Carolina granddaughters they are; Elsa, Crystal, Anna and Alice they are names of course come from the Frozen movie phenomena. What do I expect with granddaughters ages 6 and 4!! Totally spoiled, they see me and come running and begging for food and asking to get out of the coop for supervised free range time. I try to accommodate them as often as possible. All the Rhodies are finally all laying and clamoring for scratch and peck time in the woods. These Rhodies are sturdy birds that are very serious about their free ranging….they live to dig and hunt! Fully grown Rhode Island Reds are masterful egg layers. All kidding aside; I am happy to see our chickens healthy and prospering. They have glossy feathers, bright red combs and healthy bodies. They lay delicious eggs and make great fertilizer for our garden. They work the soil and keep the bugs at bay. 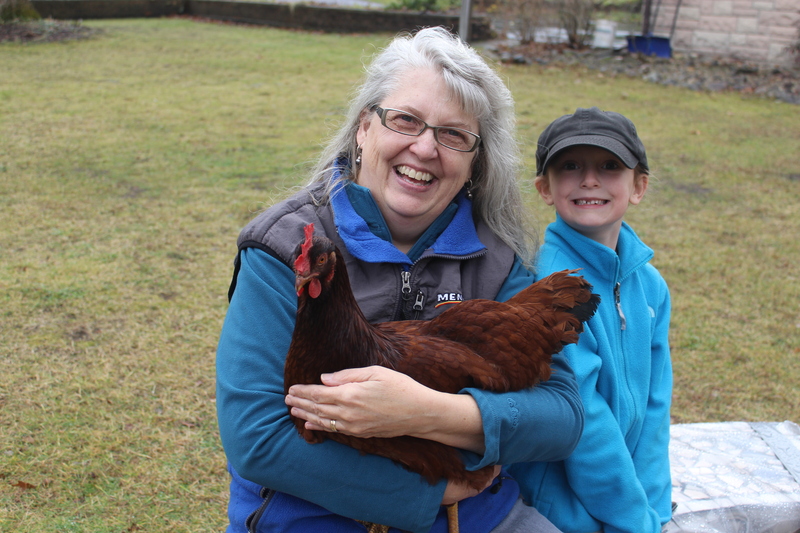 Working chickens on the homestead are part of our path to sustainability. It is hard to wrap my head around the fact that just a few days ago I was sitting in sunny and warm Florida, lodged right on the bright blue Atlantic Ocean. It was a wonderful and relaxing few days in a place and a lifestyle that is frankly, foreign to me. The townhouse my brother rented and graciously allowed me to stay in. However the reality of winter and real life came crashing back to me when I came home to a storm front of 55 mph winds roaring in off of Lake Michigan. My stunning niece Carrie, on her wedding day. It was a whirlwind trip to Florida for my niece’s wedding – just four days total and two of them were travel days. 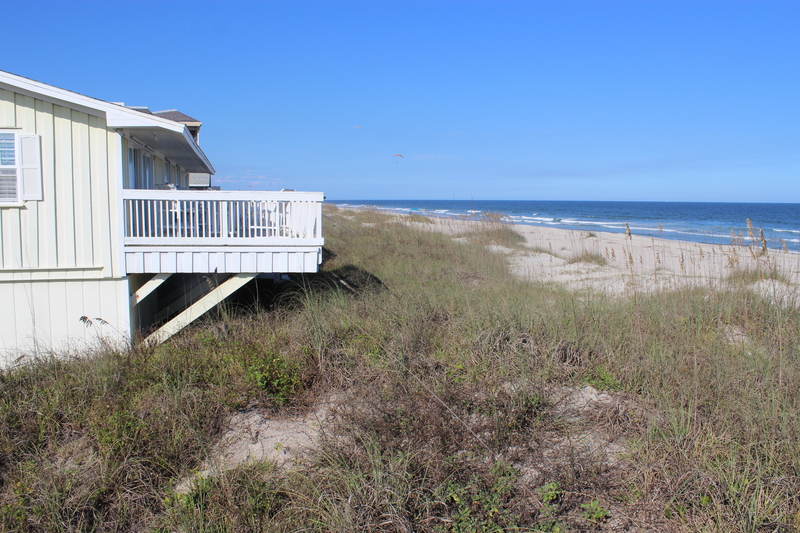 I would have loved to have spent a week or more there on the beach in the sun but I had to keep my expenses as low as possible. 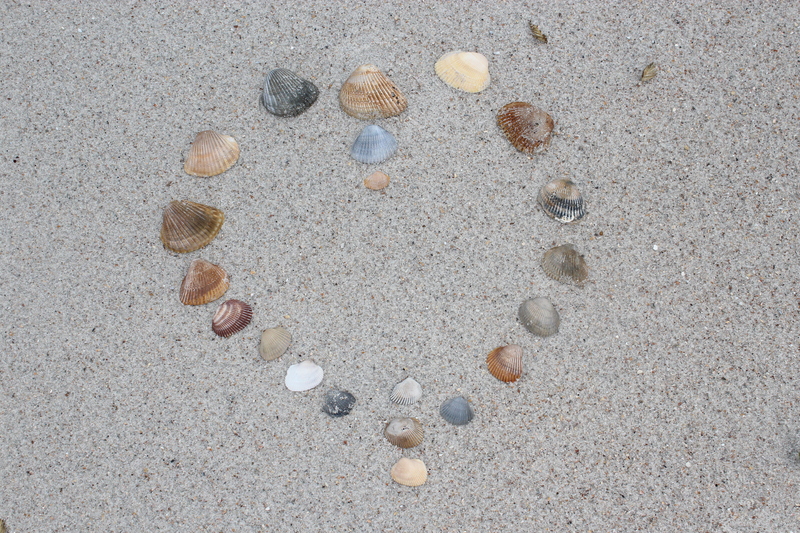 Shells I found on the beach and fashioned into a heart. This destination wedding was held at the Victorian Florida House Inn on Amelia Island. 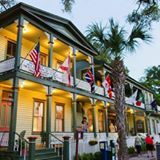 This quaint and colorful 1857 vintage inn is located in the heart of the historic district of Fernandina Beach, Florida. 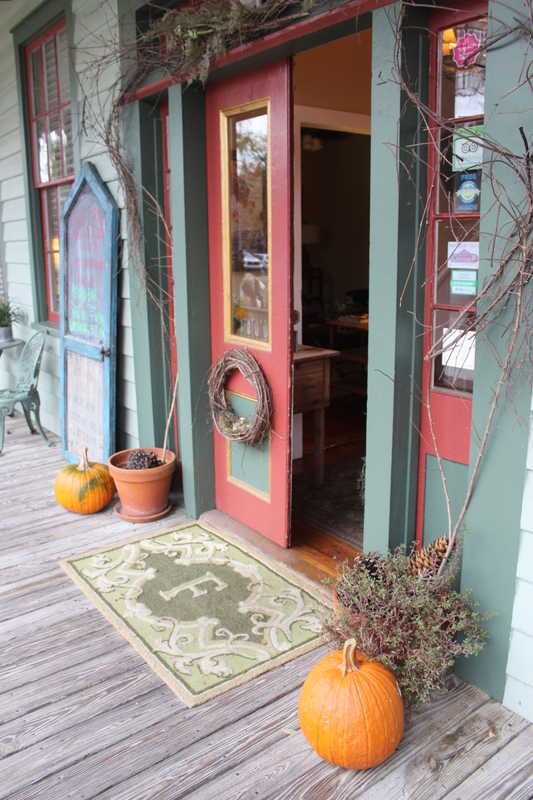 The front door of the Florida House Inn is a taste of what is to come inside. 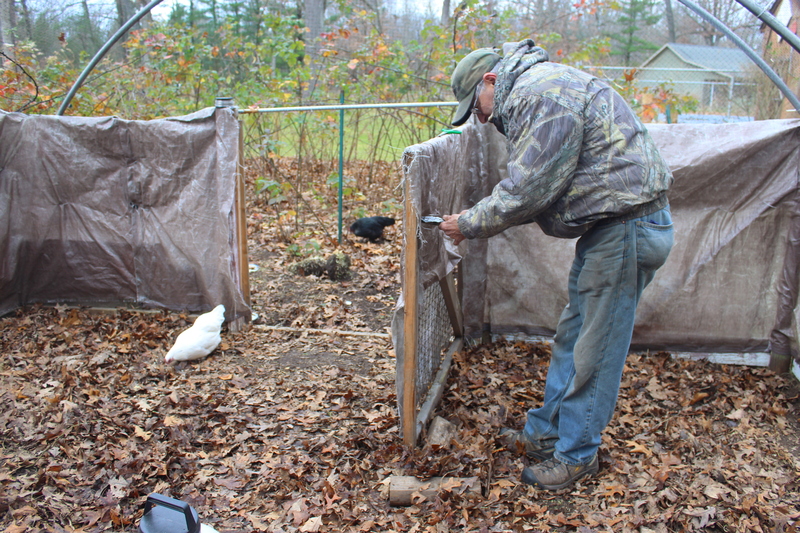 Today it was spitting sleet so Gene and I spent the morning reworking the chicken runs to protect the chickens from the high winds. Their corner lazing area needed serious reinforcement as its tarp cover was loose and blowing around and the 2″ X 4″ frame had blown down to the ground. Tarping the gate and the run fencing. 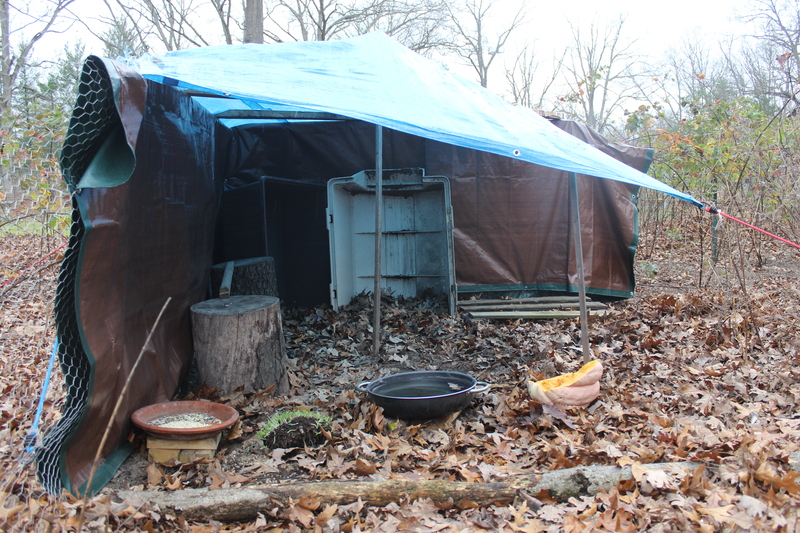 I added more dirt and leaves to the slippery base of outdoor dog kennel hang out spot that serves as a wind break and protection from the rain. I also added two long logs and a wooden pallet to give the chickens a place to stand-off of the ground. Gene added another tarp to the metal fencing to provide even more wind protection, especially from the brisk west blowing winds. 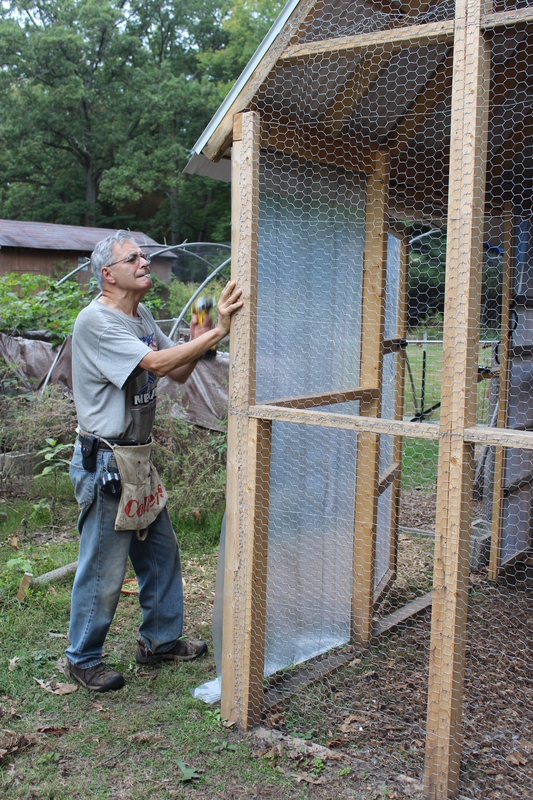 This outdoor vegging corner gives chickens shelter, food and a place to dust. I chopped open a pumpkin for the chickens to peck at and divided it between the indoor and outdoor runs. 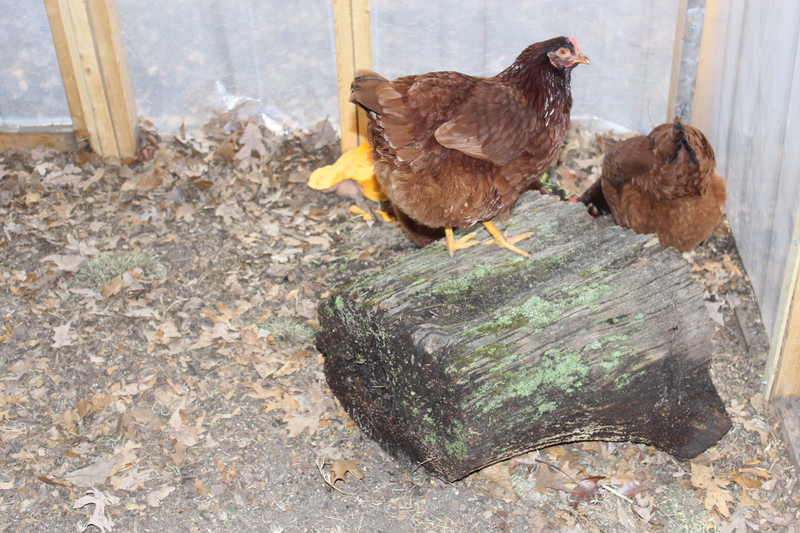 I added additional wood ashes to the dusting areas and the under coop areas and generally tried to make the covered and open runs a bit more comfortable and secure for the girls. Hay bales make a good wind break and a sheltered feeding area in high winds. 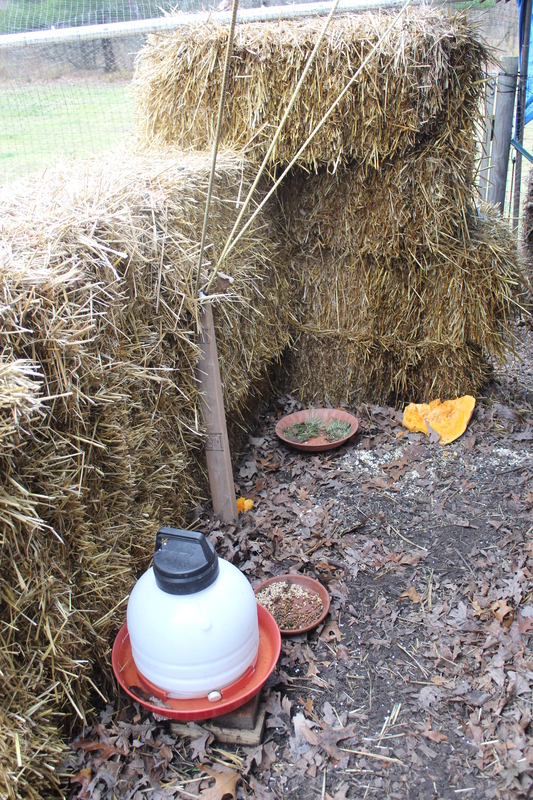 I moved the chicken feeding areas into a sheltered corner behind the hay bales to give them more protection from wind and snow when eating. Their eating areas have been out in the open, sunny run but with the changing seasons that has all changed during the last week. The girls love jumping up and off an old log I found in the woods. I also rolled an old log into the Rhodies covered run to use as a jungle gym and perching place. 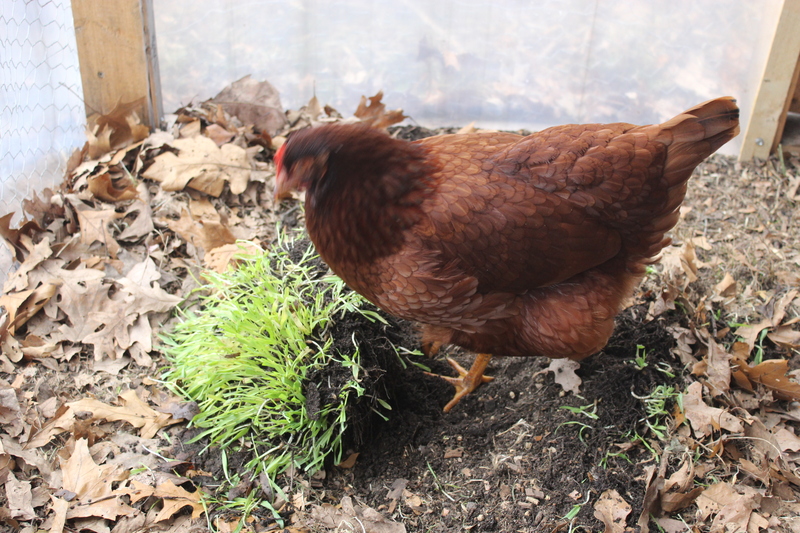 I also moved chunks of barley grass into the covered run that I grown in the open run areas. My goal is to keep live greens available and help to keep boredom at bay as boredom leads to infighting. A chunk of barley grass helps to keep the busy on a boring inside the run day. I am trying in particular to give our Cochin/Phoenix mix, Freckles, more options to eat and rest out of the wind. Freckles as you may recall has been under the weather in her post-brooding and molting months. Freckles, the Phoenix/Cochin mix in better health. We have been giving Freckles a small amount of cat food each morning in a special efforts to get more protein into her. We have been separating her for feeding from the others who quickly gobble up her food. This lowers her stress that arises from pecking and marauding from the other birds and has been a strategy this is working. This week her very pale comb has slowly pinking up on tis way to a normal red color. Her eyes have brightened a bit as well. She is still nervous around the Rhodies and avoids eating with the others in fear of being pecked but she is doing a bit better each week. My goal is to have her well as soon as possible because winter is coming very soon. It is 32 degree today and spitting snow…..goodbye fall. Hello winter. The chill of fall is in the air on the homestead and we had a welcome rain blow into our area today. The weather is cooling off quickly here and it’s nearing time to bust out the hot cider, warm throws and the Eden Pure space heater. The plastic storms will end up on the inside of the wire. 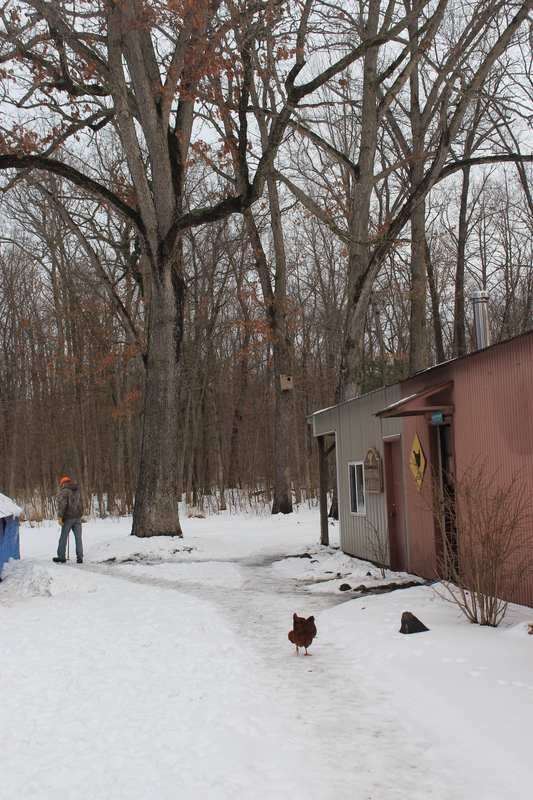 I am always looking for the best winter strategies for helping our chickens deal with the Michigan cold weather; deep snow and winds. The Farmer’s Almanac is predicting a harsh winter this year and I want to be ready. 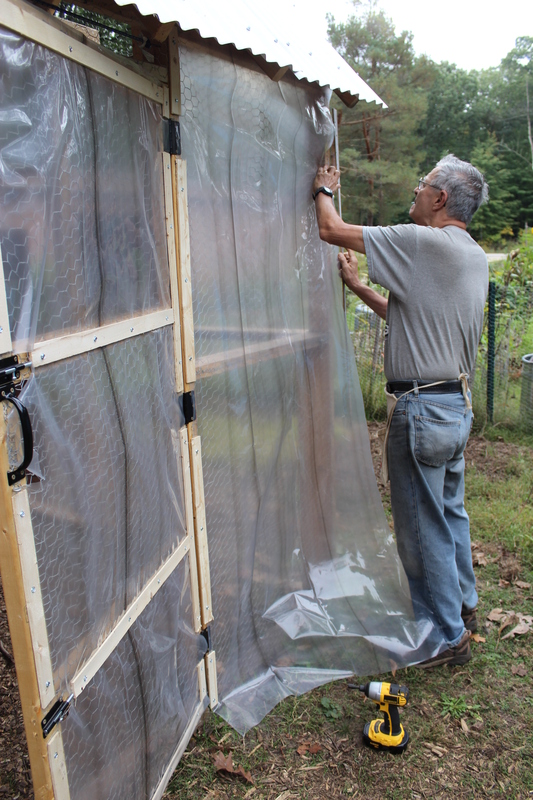 Gene has begun building the plastic storms for the new chicken coop and run. He is using 4 ft. long lathe wood strips he buys at Menard’s and cuts 8 mill heavy-duty plastic to fit and screws them both into the wood of the run to make a kind of storm window. This will provide a wind break barrier for the chickens and turn the run area into a mini sun room for the winter. Because we live 17 miles inland from Lake Michigan we can get some pretty wild windstorms here in the winter with temperatures up to 20 degrees below. 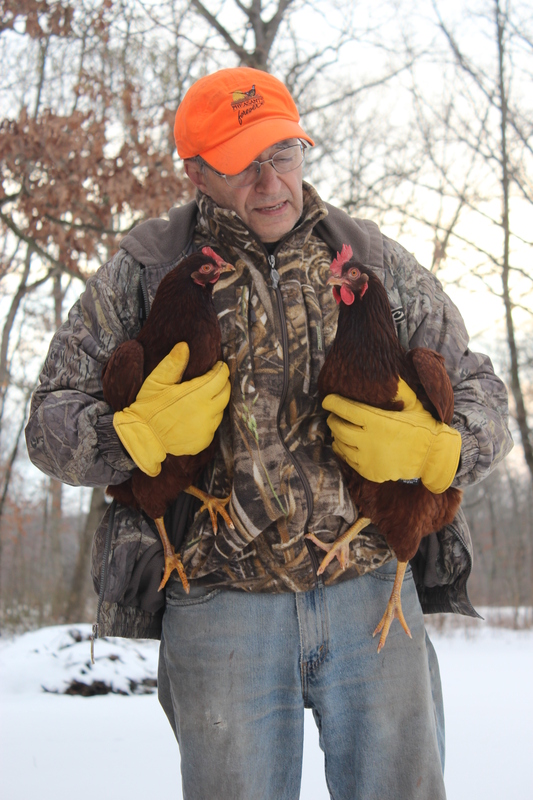 In my experience chickens can manage pretty well in the cold as long as they have enough high quality protein to help them build heat internally but they do not prosper in direct drafts. 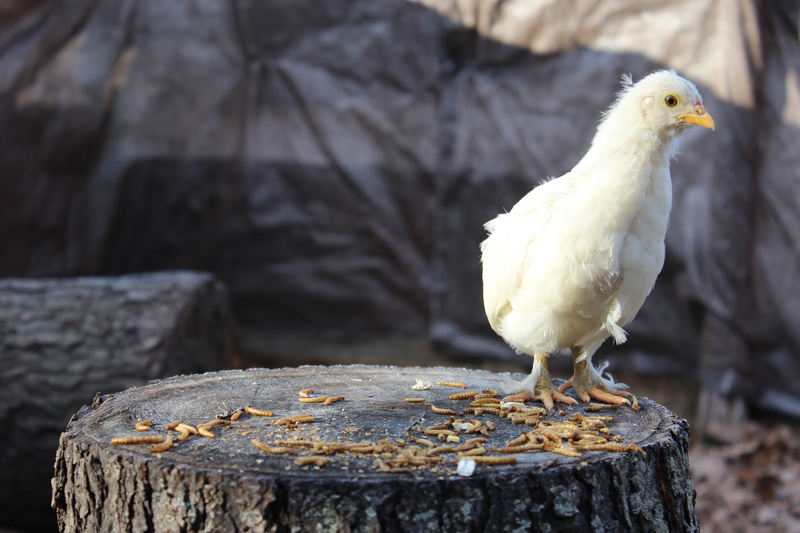 Chickens are birds not mammals, so they do not require heat in the winter. Their bodies interpret the cold much differently than we do. Both Rhode Island Reds and Cochin Bantams are considered cold hardy breeds with small combs and they will do just fine with bit of planning and my help. The enclosed Rhodie run with screening on but not storm windows. So our enclosed run system with plastic storm windows is our answer to combating drafts. Having this space is also a way to get them out of the coop 24/7 and to provide them with some wintertime exercise as well. 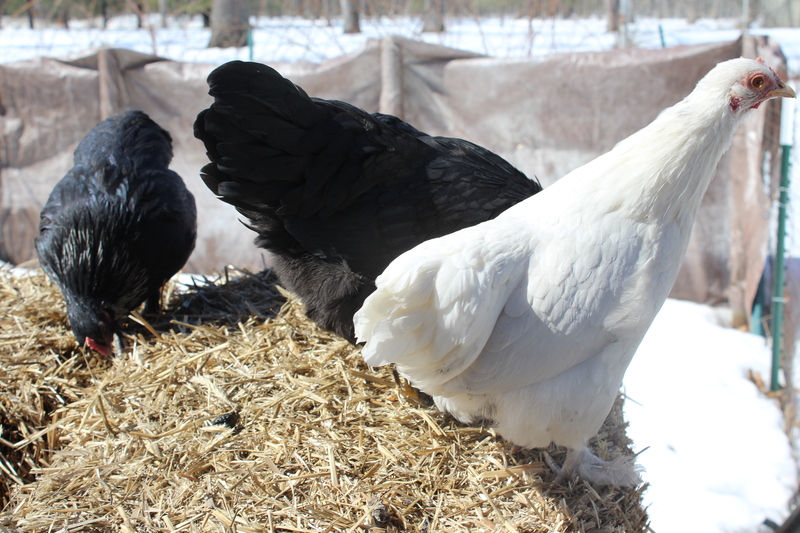 Last winter I saw our lightweight Cochin Bantams reacting negatively to the strong winds and it was obvious to me that they are not fond of the wind blowing them around. The plastic storms are going up one panel at a time. Last winter they liked hanging out in the enclosed “playpen” run and this year we plan to re-create the same system again. 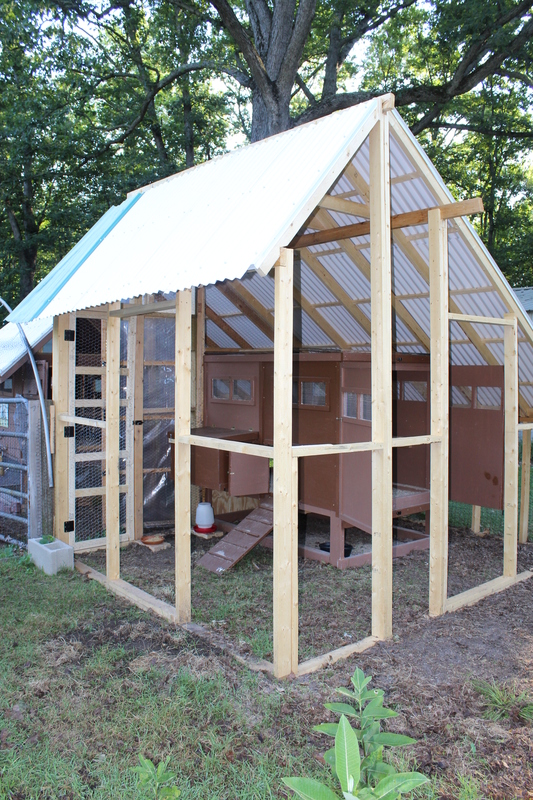 We designed both coops so that they open out into the shared enclosed run through chicken doors. This way the chickens can choose to stay in the coop or go out into their open or their enclosed run and move around depending on the severity weather and their desires. 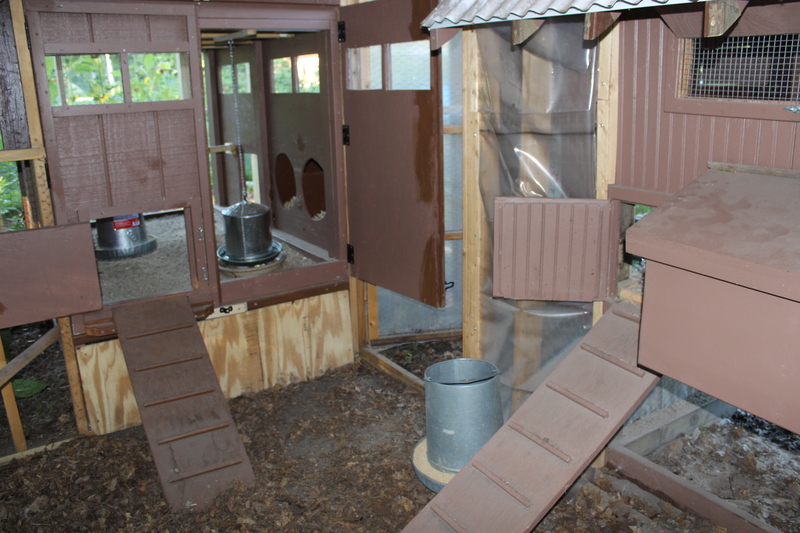 You can see that both chicken doors from each coop opens up into the run area. We are “hoping” that the two flocks will successfully tolerate each other during our six month-long winter. The Cochins and the RIR have been integrated now just over five months and are for the most part tolerating each other. How they act when both flocks are sharing the same covered run for months at a time and eating their food and water from the same physical area remains to be seen. Yes, we have spoiled but very happy chickens!